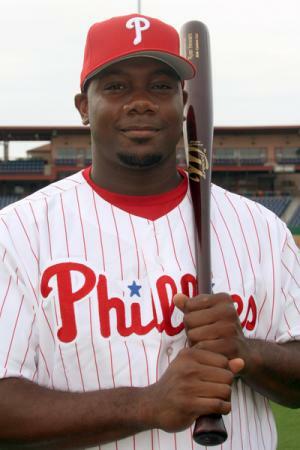 Ryan James Howard was born on the 19th November 1979, in St. Louis, Missouri USA, and is a baseball player, who plays In the position of first baseman for the Philadelphia Phillies of Major League Baseball (MLB). His professional playing career began in 2004. Have you ever wondered how rich Ryan Howard is, as of mid-2016? According to authoritative sources, it has been estimated that Ryan Howard`s net worth is as high as $60 million, an amount earned through his successful career as a baseball player; his annual salary is $25 million, which will undoubtedly increase further his already respectable net worth. Ryan grew up in a family of four siblings, which includes his non-identical twin brother Corey. He fell in love with baseball while he was still a child, and his favorite team was the St. Louis Cardinals. He began to play on a competitive level in college, while attending Missouri State University, where he recorded 50 home runs, 183 runs batted in(RBIs), and a .335 career batting average in 172 games played. He won several awards, including the Missouri Valley Conference Freshman of the Year. After he finished his college education, Ryan entered the 2001 MLB Draft, and was selected only in the 5th round by the Philadelphia Phillies, however, hard work and devotion eventually brought him to where he is now, one of the best players in the league. He spent four seasons in the minor leagues, playing for the Reading Phillies, and set several records and won awards which only helped him reach the major league sooner.He w as brought up into the Philadelphia Phillies squad for the first time in September 2004, and debuted against the Atlanta Braves. In 2005, Ryan`s game numbers were outstanding, having .288 average and 63 RBI, which earned him the Rookie of the Year Award. The following season was even better, as he won the NL MVP Award, having a .313 batting average, hitting 58 home runs and 149 runs batted in. Since then, his career has gone only upwards, and so has his net worth, as he has signed new contracts, which only increased his net worth. During his career he has won several prestigious awards, both as an individual and as a part of the team; he has three All-Star game appearance, in 2006, 2009 and 2010, and he was the World Series champion with the Phillies in 2008. Furthermore, he won the Silver Slugger Award in 2006, and was twice MLB home run leader, in 2006 and 2008, three times MLB RBI leader, in 2006, 2008 and 2009, and he also received Roberto Clemente Award in 2015. Ryan holds several records, including the ones for most home runs by a Phillies batter in one season with 58, fewest games for 100 home runs with 325, and fewest games for 200 home runs with 658, among many other records. Ryan`s net worth has also increased from his TV appearances; he appeared in an episode of the popular TV series “It’s Always Sunny in Philadelphia” in 2010, and he has also featured in “Entourage”, and “Office”. When it comes to his personal life, Ryan has been married to Krystle Campbell since 2012; he has a son, named Darian Alexander from one of his previous relationships. 1 Broke Philadelphia Phillies record with 58 homeruns in 2006. 2 Made major league debut on 1 September 2004. 3 First baseman with the Philadelphia Phillies, 2004-present.